Featuring new and returning Colorado artists AND demos of how they create their art. At least one of the demos will be interactive, so please join us for some fun creative learning and expression. Stay tuned for more information on the demos! – Drop off accepted art on Saturday May 4 between 10 am and noon at the Nederland Community Center. Bring your art to the conference room on the lower level of the Community Center. – Reception on Thursday May 16 from 4:30 to 7 pm at the Nederland Community Center. NOTE the earlier start time to allow more opportunity to participate in the demos. *See the section below titled “For Artists Interested in Submitting Their Work” for more information on how to submit your art for the show. Art at the Center is the realization of a long term vision for the Nederland Community Center. 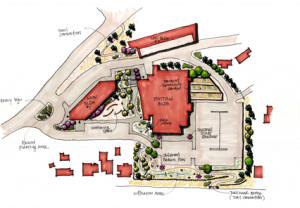 This vision saw the Community Center as a vibrant and beautiful hub for our town and a perfect place to highlight and support Nederland’s image as an emerging artisan center. Beginning in 2009, through the efforts of the Community Center Foundation Board, Art at the Center was born. From the beginning, Art at the Center has been a great success. Our opening wine and cheese event took place in an October snowstorm, yet almost 200 people showed up to support the celebration of both the talented artists being featured that night and the fact that the Community Center had been beautifully enlivened by art on the many long, previously empty walls. Three times per year the Nederland Community Center and the volunteer Art Committee host a new Art at the Center show focusing on local artists. Nederland area artists are invited to participate via newspaper ads, word of mouth and requests to local galleries. A panel then selects the pieces that will be displayed for the next show. Generally, within ten days, after the show has been hung on the Community Center walls, the Community Center organizes a free Wine and Cheese Open House event for the community honoring the featured artists. Artists are encouraged to attend to answer questions and speak about their work. Local musicians provide ambiance. Often, Nederland restaurants, liquor stores and grocers donate some portion of the delicious food and wine. At each open house, “Best in Show” awards are given in the categories of painting, photography and a third category that includes fiber art, jewelry and sculpture. The art then remains on display for 3-4 months for all Community Center visitors to enjoy. Local artists have been very involved and enthusiastic about submitting their work, without which we could not have such exciting art shows. Artists may submit up to 6 ready-to-hang 2-dimensional pieces no smaller than 12” x 12″ framed. We are also now accepting ready-to-hang fiber art (any size larger than 12”x12”) and a limited amount of jewelry and small pottery pieces for a glass case display. Artists may submit up to 6 pieces of these types of art. All pieces must be original works of art. Art work needs to be dropped off at the Community Center during the specified times or alternate arrangements can be made by calling us. Two-dimensional pieces must be signed by the artist and, to work with our system, need to be hung by a wire mounted on the frame. Artists will be asked to sign a liability waiver and registration form at the time of dropping off their work. We ask that a paragraph be provided about the artist and his/her artwork. A photo of the artist with this bio is appreciated. Artists need to bring the bio with the artwork to the drop off. Artists must supply title cards for each piece that include contact information, price (if for sale), medium (painting, photography or mixed media) and size of piece. Artists must also submit a list of the titles of work being submitted. Artists are asked to contribute a $20 donation toward the Open House at the time of registration. This fee will be waived if it provides a financial hardship to the artist. No sales can occur through the Community Center, but we ask for contact information should someone wish to contact an artist for purchase. Artists whose works have been displayed at earlier shows may submit pieces for the current display. We will do our best to display something from every artist who submits. All displayed works will remain up for 3-4 months. Artists must contact the Art at the Center Coordinator if they need to remove any artwork. Removed artwork must be replaced by a similar size and quality piece. Please feel free to share this information with any interested artists you know. We want to get the word out to the entire community! The Nederland Community Foundation is undergoing restructuring. More soon!